Dry-process Compression and Granulating System Roller Compactor | Product Information | KURIMOTO, LTD.
By dry-process granulation, you require no humidification and drying stages. This system is the best-suited to granulate materials which are unstable to water or solvent and subject to thermal transformation. 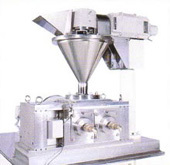 By compaction with pressure rollers, you can produce high-density particles and granulated powder. The Kurimoto High-pressure Type Roll Compactor offers larger compression force, enabling you to produce high-density and high-intensity products. Even though the hydraulic cylinder is used to apply compression force, since the operative pressure of the hydraulic cylinder can be easily adjusted, you are able to reduce the compression force for soft granulation. The screw performance exerts a significant influence upon the granulating capability of the Roll Compactor. The Roll Compactor has a high-performance screw, which have materials intruded between the rolls to facilitate de-gassing. By freely varying combination of breakers, several types of granulators for fine particle and sizing use, and granulators with screen, you can efficiently get a target particle size.